When it comes to matters of language and linguistics, the popular media’s “scientific” reporting typically sensationalizes studies that make outlandish (and often unsupported) claims, while ignoring other work on the same topic. 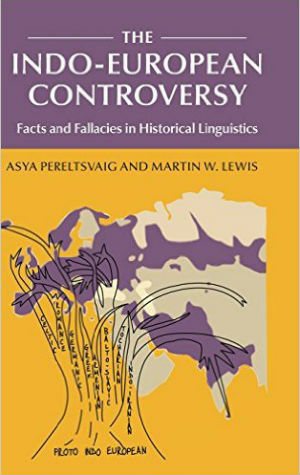 In the next few posts we will look at several articles on specific Indo-European languages that have recently received much attention in the press and the blogosphere, starting with a revisionist history and classification of the English language. In the last decade or so, renewed attention has been paid to the history of English in academic circles, leading to the publication of several new textbooks by principal academic presses. 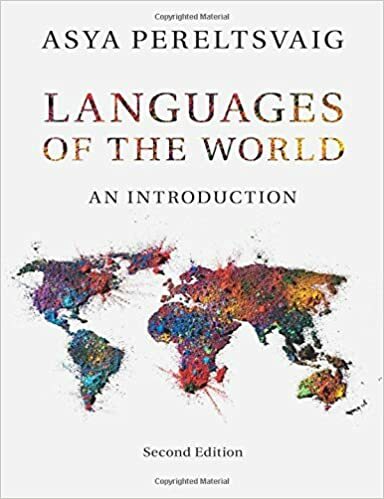 Cambridge University Press came out with A History of the English Language, edited by Richard Hogg and David Denison, as well as a much more accessible The English Language. A Historical Introduction by Charles Barber, Joan C. Beal and Philip A. Shaw. Oxford University Press countered with The Oxford History of English, edited by Lynda Mugglestone. Scholarly monographs and trade books in the field have been published in large numbers as well. 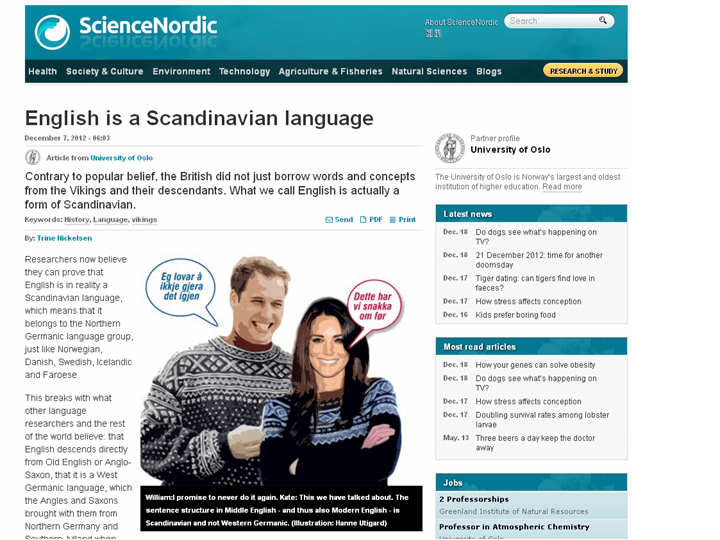 Yet none of them has received as much public attention as a yet-unpublished manuscript by Jan Terje Faarlund of the University of Oslo and Joseph Emonds, visiting professor from Palacký University in the Czech Republic, who claim that English is a Scandinavian language. The story was originally broken by ScienceDaily, which justly characterized the claims made in the paper as “sensational”. Other media outlets in the English-speaking world, such as The Economist and Business Insider (which reposted the piece from The Economist under a different headline), were more tempered, formulating the headlines as questions or using the modal may. But Scandinavian websites as well as several English-language blogs came out with resolute headlines. ScienceNordic went so far as to illustrate their piece with a picture of prince William and Kate Middleton wearing traditional Scandinavian sweaters, and Aftenposten, a leading Norwegian daily, simply affirmed that “English is a Scandinavian language”. The title of the k2p blog post is more detailed but equally firm: “Modern English derives from Scandinavian rather than from Old English”. 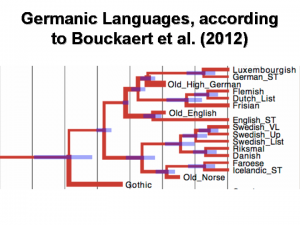 As a result, the authors contend, Modern English is quite different from Old English, and also from modern West Germanic languages, such as German, Dutch, Frisian, Afrikaans, and Yiddish. As is well known, many English words do not match their German (or Dutch) counterparts: compare the English die and German sterben, or the English ill and the German übel. These English words derive from Old Norse deyja and illr, which replaced the Old English words steorfan and yfel. (The Old English words did not die completely, however, but survived as starve and evil.) It is well-known that the Norse-speaking Vikings gave the English many words which they took and still use, whether that seems both odd and wrong to some fellows (the boldfaced words in this sentence are all Norse contributions). In a sentence like The guests cut the rotten cake with a knife, only the articles the and a are not traceable to Scandinavian sources. ** Among Norse loanwords in English are basic kinship terms (sister, husband), body parts (leg, neck, skin), other common nouns (dirt, sky, window), adjectives (flat, loose, ugly), and verbs (drag, get, smile). 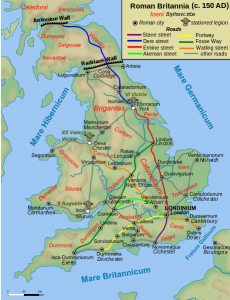 Northern English dialects, spoken in areas that once constituted the Viking-dominated Danelaw, contain even more words from Old Norse, such as fell ‘hill, mountain’ (compare with Norwegian fjell) and kenning ‘knowledge’ (compare with Swedish kännedom ‘understanding, cognizance’). In northern English cities like Leeds and York, toponyms with -gate like Briggate and Kirkgate translate as ‘Bridge Street’ and ‘Church Street’, because in Scandinavian gate means ‘street’ (in contrast, in London places such as Aldgate and Newgate actually refer to former gates in the city wall). 1) Word order: Both English and Scandinavian place the object (underlined) after the verb (boldfaced), whereas German and Dutch put the verb at the end. English: I have read the book. Norwegian: Jeg har lest boken. German: Ich habe das Buch gelesen. 2) Preposition stranding: In both English and Scandinavian the preposition (boldfaced) can appear at the end of the sentence, with its related noun or pronoun (underlined) placed in the beginning. *** This structure is much more restricted in German or Dutch. English: This we have talked about. Norwegian: Dette har vi snakket om. 3) Split Infinitive: In both English and Scandinavian we can insert a word such as an adverb (boldfaced) between the infinitive marker to and the verb (underlined). This structure is also highly restricted in German and Dutch. English: I promise to never do it again. Norwegian: Jeg lover å ikke gjøre det igjen. 4) Phrasal (or “Group”) Genitive: The possessive marker in both English (‘s) and Scandinavian (s) can appear after a whole phrase like the Queen of England, not after the main word (i.e. head) of that phrase (here, Queen). So the change from Old English to Middle (and hence, Modern) English was not in the introduction of a completely novel structure, but in a change in the range of contexts where it is possible. The Old English option of separating a personal pronoun from its preposition, as in the above example, died out soon after 1200. Around the same time, preposition stranding became possible with passives (as in ‘dealt so cruelly with’), and later extended to relative clauses (e.g. ‘the book which we have talked about’) and questions (e.g., ‘Who did you talk to?’). In the following post, we will consider the other syntactic structures presumed to be of Nordic origin, as well as the more general issue of whether languages borrow grammar. *The Gray-Atkinson model (see the image on the left from Bouckaert et al. 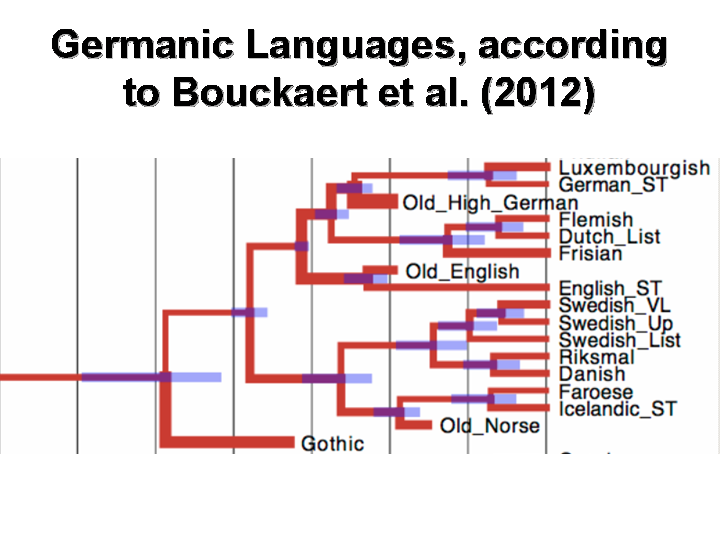 2012) incorrectly classifies Frisian as most closely related to Dutch, not to English. **The word with existed in Old English in the form of wið meaning ‘against, opposite, toward’; this older meaning is preserved in compounds such as withhold, withdraw, withstand. 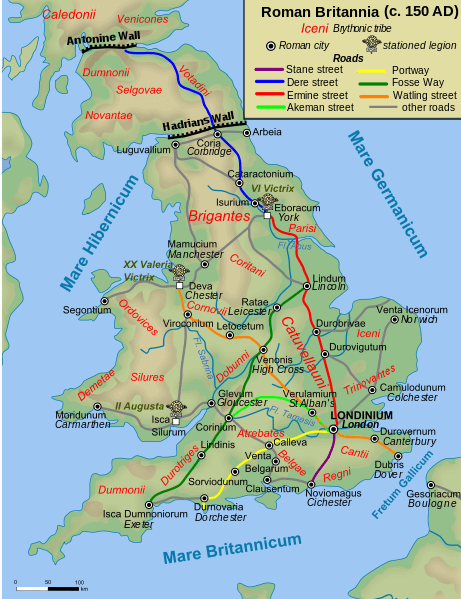 The influence of the Old Norse vidh is responsible for the meaning shift in Middle English to denote association, combination, and union. In this meaning, with replaced the Old English mid ‘with’, which survives only as a prefix, as in midwife, literally ‘woman who is ‘with’’ (the mother at birth). The original sense of wife ‘woman’ (regardless of marital status) is also preserved in the expression old wives’ tale. ***When it comes to preposition stranding, one has to be careful at distinguishing true prepositions (which can be stranded) from particles (whose syntax is quite different, as evident from the humorous hypercorrection This is nonsense up with which I will not put, attributed to Winston Churchill, or alternatively to Bernard Shaw).